Black plum is the fruit of the Jambul, a.k.a. Jamun tree. In the ripe stage it is simply consumed as a fruit. It is advised to have jamun fruit with salt due to some health reasons. Black Plum is used to prepare candies, jams, squash, juice, dessert items and many more. The black plum is known to relieve stomach pain, carminative, anti-scorbutic and diuretic. Jamun vinegar is good to reduce enlargement of spleen, diarrhea, and who has urine retention problems. Jamum’s ployphenolic compounds are effective against cancer, heart diseases, diabetes, asthma and arthritis. Various digestive disorders i.e. 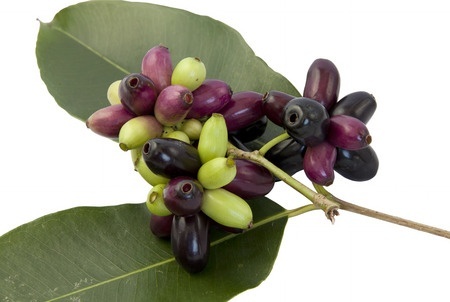 flatulence, bowel spasm, stomach disorders, dysentery are cured by jamun. It is also eaten as tonic to increase sexual activity. Jamun is known by different names such as jambul, jambas, jamun, jambolan, rajaman, kala jamun, neredu, naval, nerale, jamali, java plum, black plum and black berry.